Of fish, ghosts and trees with knees. At about the third brush pile we probe along Big Cypress Bayou, I have an epiphany. Three heads swivel in my direction. Fishing guide Randy Parker, his son Chad and my wife, Zoe Ann Stinchcomb, wait to be enlightened. “You’re not sitting under a bridge listening to cars and trucks roaring by overhead,” I explain. Actually, that’s not the best part at all. The best thing is Caddo itself. Caddo Lake straddles the border between Texas and Louisiana, but its 27,000 acres spread across more than the East Texas landscape. They span time itself. People come here to go back in time, escape time, kill time. 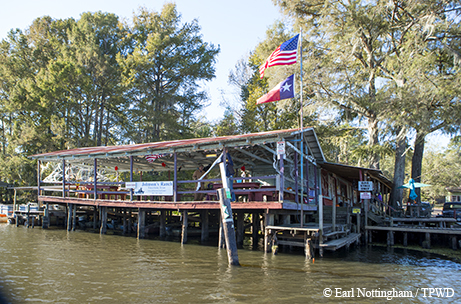 There’s Johnson’s Ranch Marina, which claims to be the oldest such establishment in Texas. Not far down the road is the lakeside home of Don Henley, lead singer of the Eagles and perhaps the lake’s most prominent supporter. There’s Government Ditch, cleared of cypress trees and dredged in the 1800s to improve access for steamboats hauling cotton outbound and fine furniture and other trappings of civilization inbound. One of those steamboats was the Mittie Stephens, which burned on the lake in February 1869 when hay bales on the bow caught fire. Many people who could not swim stayed on the boat and burned to death. Others jumped overboard and were caught in the paddle wheels and crushed as the crew tried to beach the boat. Tragically, the bow of the boat reached the shore and people could have jumped off the bow and walked out, but the fire drove them to the stern, which was in 10 feet of water. More than 60 people died. Like a fiend through a lurid lake. Caddo is like that. It’s emotionally, intensely visual. It grabs people and won’t let go. Once you’ve visited, and perhaps kayaked its boat roads and bounced lures off cypress knees hoping to catch a rare chain pickerel and marveled at the sunlight streaming through the wispy strands of moss adorning every tree, you understand that there is something about this lake unlike any other in Texas. Ghosts dwell here. Not real ghosts, of course, should such exist. (And if they do, I know of no more likely place to find them.) One candidate would be Robert Potter — fugitive from a violent past in his native North Carolina, signer of the Texas Declaration of Independence, soldier at the Battle of San Jacinto, first secretary of the Texas Navy and a member of the Texas Senate when Texas was a nation. Embroiled in a feud with neighbors, Potter attempted to escape a mob surrounding his home on the shores of Caddo Lake by swimming away, but was shot and killed. His body was recovered and buried at his home on Potter’s Point and later moved to the Texas State Cemetery in Austin. Randy Parker has a missing-body story. He and his son shot a deer on their lease nearby and brought it back to their camphouse on Caddo Lake to process. They left the boned-out carcass in a shed out back overnight, secured behind a chained gate. During the night they heard an awful scream, and the next morning the gate was open and the carcass gone. Bear? Bigfoot? Trickster? Ghost? Only Caddo knows. These thoughts compete for my attention as we continue our search for crappie. 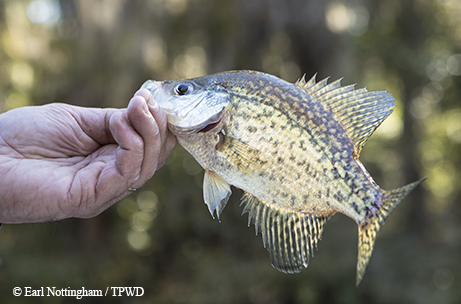 Crappie tend to hang out in deep water in winter, and those on Caddo are no exception. Perhaps that’s why we are not fishing on the shallow main lake but in the channel of Big Cypress Bayou. Getting hung up — snagging the hook on brush — is so common that both Randy and Chad wrap a thumb and forefinger with black electrical tape to protect their fingers when they bend straightened hooks back into shape. Randy rigs Zoe Ann and me with minnows, while Chad prefers to fish with what he calls a “Caddo Special,” a tiny plastic lure with a black-and-red head and a green skirt. It looks like it could be a bug to me, but Chad thinks it looks like a baby bream. Either way, it catches crappie, as do the minnows. Fishing in the current on Big Cypress Bayou reminds me of fishing the Kenai River in Alaska. In both places you use long, limber poles — fly rods in Alaska, crappie rods on Caddo. Placing the bait requires synchronized casting by the anglers on the same side of the boat. At the same time, everyone lifts their rod tip and pulls in enough line with their left hand to raise the bait from the water, then swings their rod tip in the direction the boat is moving, releasing the line on the swing and lowering the rod tip at the end to put the bait back in the water. As the boat moves, you keep your rod tip pointed at the bait and wait for the thump that signals a crappie has made its last mistake. It sounds harder than it is. Despite that advice, both Zoe Ann and I — and Chad, to be truthful — miss a few hook-sets. But the ones that are successful bring in some impressive crappie. A number of the fish are more than a foot long; some push 16 inches. Some are white crappie, some are black. What’s more impressive is how thick the fish are across the “shoulders.” One fillet from one of these fish will make a satisfying meal. Although we don’t fish under the Texas Highway 43 bridge just upstream from the Caddo Lake State Park boat ramp where we launch, it’s an important landmark when fishing there. Downstream of the bridge is considered to be part of Caddo Lake, where there is no minimum length limit on crappie. Upstream of the bridge, crappie must be at least 10 inches long to be legal. If you fish both above and below the bridge, it’s best not to keep any fish under 10 inches in case game wardens check you while you are downstream of the bridge. 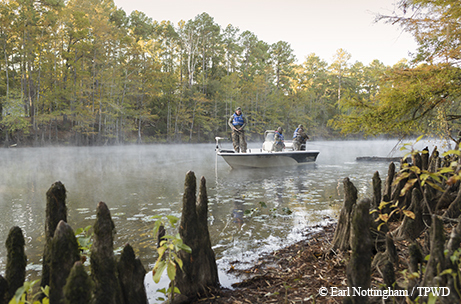 Fishing is as good an excuse as any to visit Caddo, but there’s camping, kayaking and hunting, too. The state park has cabins as well as tent and RV sites. The adjacent wildlife management area has several primitive camping areas accessible only by water. Private accommodations, restaurants and private homes ring the lake, part of the town with the quirky name Uncertain. It is arguably one of the most captivating places in Texas. 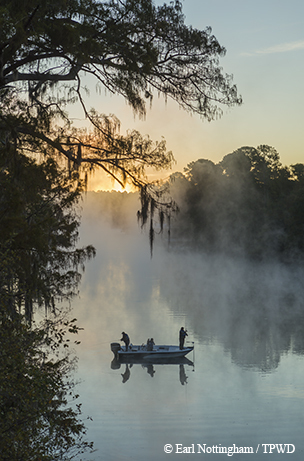 Caddo Lake has given rise to its share of ghost stories, but it has created far more pleasant — and lasting — memories. Whangdoodle Pass, Hog Wallow, Hell’s Half Acre, Old Folks Play­ground — all these places and more wait for you on Caddo Lake, guarded by water, moss-draped trees and the mists of time. And maybe a ghost or two. Of all the things that define Caddo, the iconic cypress trees would seem to be the least likely to disappear. However, the very forces that created the lake may prove to be their undoing in the long run. Big Cypress Bayou and flooded a much larger area, killing many hardwood trees but again, because of fluctuations in level, allowing cypress trees in shallow areas to survive. The Great Raft was cleared in 1873 to improve navigation on the Red River, dropping the water level and shrinking the lake to the point that much of the present-day lake bottom was farmed. In 1914 a weir was built in Louisiana to raise the lake level, which now averages about 7 feet deep. These changes had a huge impact on Caddo Lake — and the cypress trees. The oldest trees are about 400 years old. Others date from the time of the Great Raft and are around 200 years old. The youngest trees, about 100 years old, started growing about the time the weir was built. Since the trees require changing water levels to grow, very few new trees have become established in the last century. Unless a way is found to allow new cypress trees to become established, at some future time they, too, may become ghosts. Caddo doesn’t need any more ghosts.